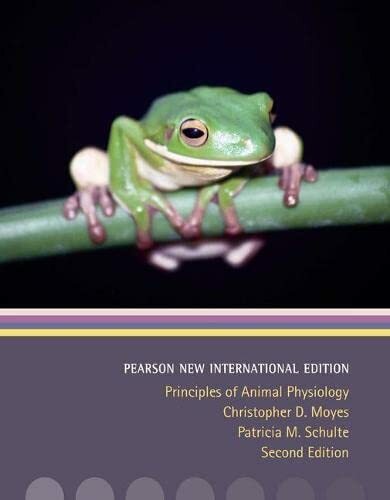 Principles of Animal Physiology, Second Edition continues to set a new standard for animal physiology textbooks with its focus on animal diversity, its modern approach and clear foundation in molecular and cell biology, its concrete examples throughout, and its fully integrated coverage of the endocrine system. Carefully designed, full-color artwork guides students through complex systems and processes while in-text pedagogical tools help them learn and remember the material. The book includes the most up-to-date research on animal genetics and genomics, methods and models, and offers a diverse range of vertebrate and invertebrate examples, with a student-friendly writing style that is consistently clear and engaging. Christopher Moyes and Patricia Schulte present animal physiology in a current, balanced, and accessible way that emphasizes the integration of physiological systems, an overarching evolutionary theme, and thorough coverage of the cellular and molecular basis of animal physiology. Principles of Animal Physiology comes with a comprehensive supplements package for students and instructors that includes a new Media Manager CD-ROM, a new Print and Computerized Test Bank, and a powerful Companion Website. The InterActive Physiology (R) 10-System Suite CD-ROM and PhysioEx (TM) V7.0 laboratory simulations can be packaged with the text at a discounted price.